At the outbreak of World War II, during the Polish campaign in September 1939, the Luftwaffe had a total of 1,356 aircraft—210 fighters (both Messerschmitt Bf 109 and Bf 110), 249 dive-bombers (both Junkers Ju 87 and Henschel Hs 123) and 897 medium bombers (Dornier Do 17 and Heinkel He 11). Two hundred eight-five aircraft were lost. For the invasion of Denmark and Norway in April 1940, the Luftwaffe committed some 80 aircraft, including fighters, bombers, transport airplanes and seaplanes. For the attack against the Netherlands and France in May–June 1940, the German air force achieved its peak in terms of professionalism and strength, mustering 1,264 fighters and 1,482 bombers of all type. In August 1940, at the start of the Battle of Britain, the Luftwaffe had 734 Messerschmitt Bf 109s, 268 Messerschmitt Bf 110s, 336 dive-bombers ( Junkers Ju 87s), and 949 medium bombers (Heinkel He 111, Dornier 17 and Junkers Ju 88). Of this total of 2,287, the German air force’s losses were 663 fighters and 691 bombers by mid–September 1940. At the same time, the RAF’s losses amounted to about 800 fighters. For the Balkan operation against Yugoslavia and Greece in the spring of 1941, the Luftwaffe, still a major tactical force, was able to commit some 1,100 warplanes. For the invasion of the Soviet Union in June 1941, the Luftwaffe initially committed 2,770 aircraft. For the Kursk offensive in the summer of 1943, the Luftwaffe massed 1,700 warplanes. When the Allies landed in Normandy on June 6, 1944, the German air force was able to fly only 319 sorties. A final effort was made in early January 1945, when 750 aircraft were grouped to support the Ardennes offensive. In 1939, factories delivered about 217 bombers and 133 fighters per month; by mid–1941 these had increased to 336 and 244, respectively. From November 1941 deliveries increased from 12,400 aircraft to 15,000 airplanes in 1942 and 24,800 in 1943. Production peaked in 1944 when 40,600 aircraft were delivered. By this time, however, it was not aircraft that were required, but the men to fly them and the fuel to keep them in the air. By the end of 1944, when Allied bombers were free to roam at will over Germany, the Luftwaffe was a pale shadow of its former self, which had never been the force that Nazi propaganda claimed. At the end of the European war in May 1945, over 97,000 members of the Luftwaffe were recorded as dead, missing or wounded. The most-produced German aircraft of World War II was the Messerschmitt Bf 109 (about 35,000), followed by the Focke-Wulf Fw 190 (about 20,000). 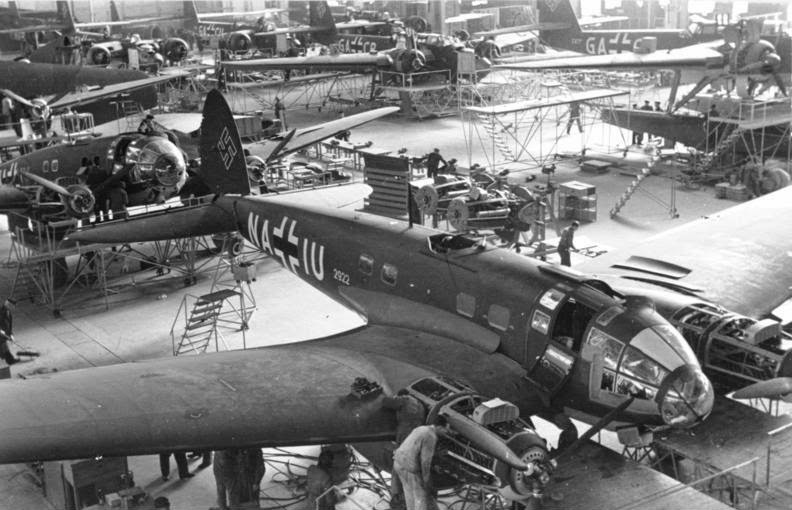 Both the Junkers Ju 88 and Messerschmitt Bf 110 had a production run of about 15,000. 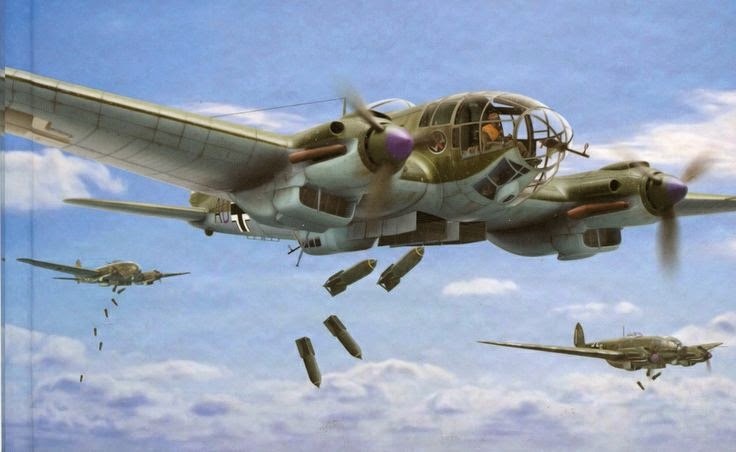 About 6,000 Junkers Ju 87 dive-bombers, and 7,300 Heinkel He 111 bombers were produced.